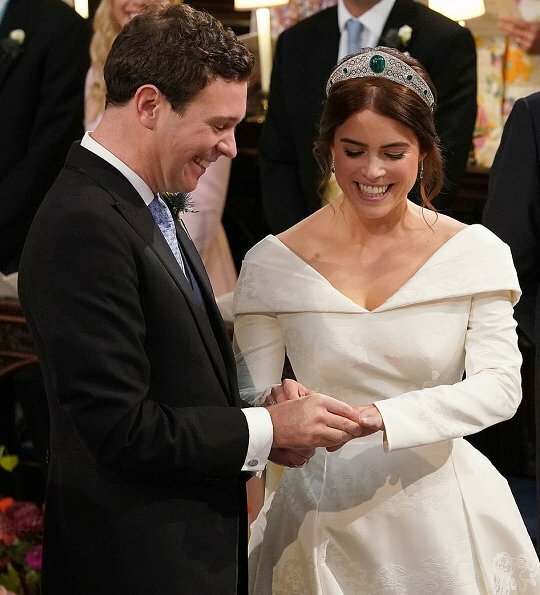 Today, the granddaughter of Queen Elizabeth, Princess Eugenie is getting married to Jack Brooksbank with a wedding ceremony at St George's Chapel. 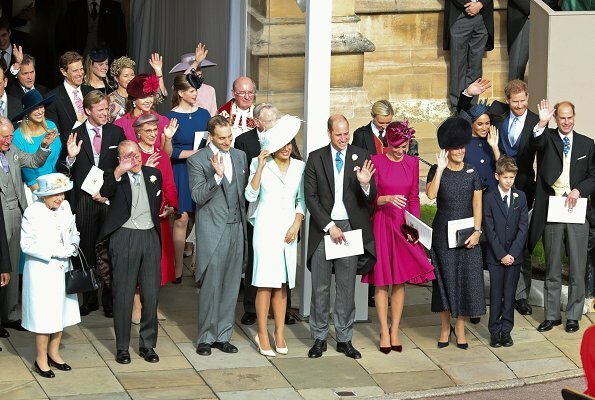 1.200 persons from all over Britain were invited to the couple's wedding. After the wedding ceremony, a reception will be held at Windsor Castle. 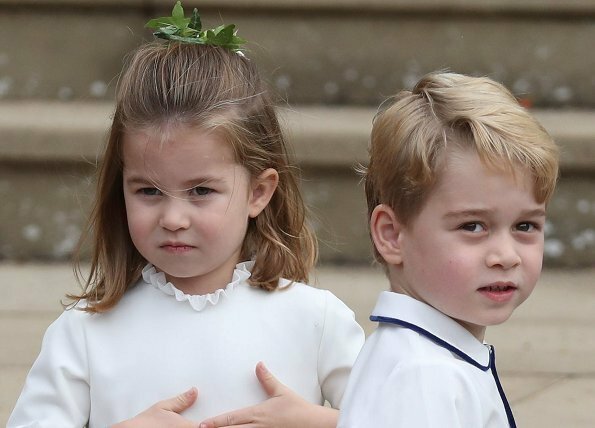 Prince George and Princess Charlotte are among the pageboys and bridesmaid taking part in the wedding. Princess Eugenie's older sister Princess Beatrice is the maid of honour and groom, and Jack Brooksbank's brother, Thomas, is the best man. 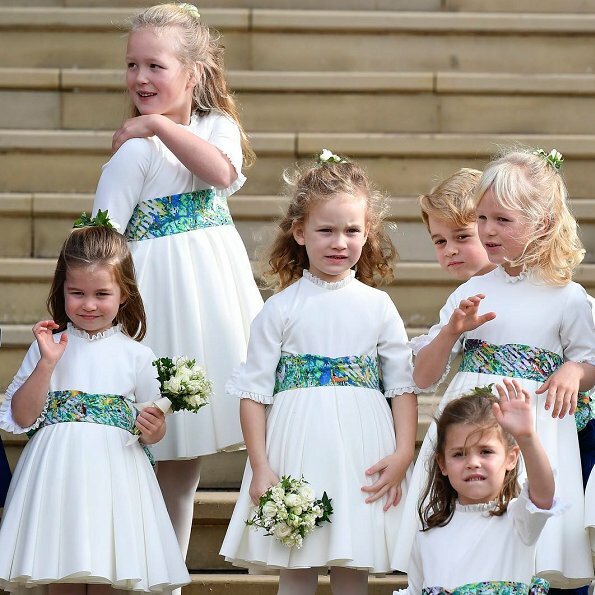 The other bridesmaids are: Savannah Philips, seven, the daughter of Autumn and Peter Phillips; Isla Philips, six, the youngest of the Phillips' daughters; Mia Tindall, four, the daughter of Zara Tindall and Mike Tindall; Maud Windsor, five and goddaughter of Princess Eugenie, and daughter of Lady Frederick Windsor and Lord Frederick Windsor. Beautiful wedding dress that suits Eugenie. Her emerald and diamond tiara is stunning. Clearly, the Queen's jewel vaults are full of amazing pieces, like the Queen Mary tiara Meghan wore. Catherine looks beautiful in deep rose. 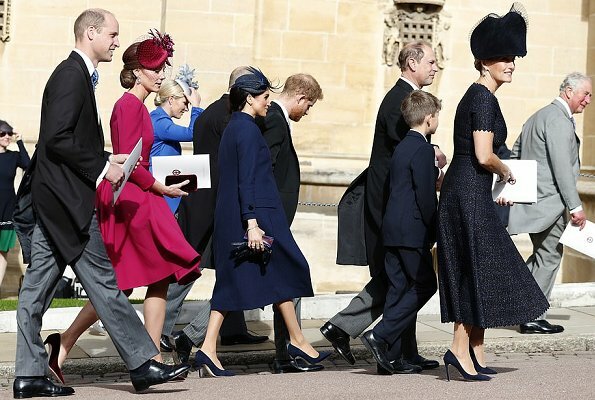 Meghan is understated and elegant--love her well-fitted hat and well-cut heels. Princess Eugenie is wonderful, really. She looks more beautiful than ever! Love the tiara choice, Greville Emerald Kokoshnik Tiara, got to British vaults 1942 and she is the first to wear it. Thanks for the information. This tiara was a beautiful surprise. Beautiful Bride and Fergie looked amazing also, in all the service was just lovely. Agree! Lovely, regal wedding and Camilla was definitely not missed. Rather surprising and quite obvious was Camilla's absence. Charles has other engagements and he flew down. But, agree that she was not missed. Sarah is the one I have missed. What a treat to see her and her genuine, vivacious personality. Love her in green for her beautiful daughter's wedding! The material of the Bride's dress is so beautiful, i wish the sleeves were more fitting and the extra bit of the shoulder was not necessary. In keeping with the autumnal theme, the Countess of Wessex wore all black. The color Meghan is wearing is ok, its just the shape of the coat looks like maternity wear but she is not pregnant atleast not visible! I have been amused and enchanted by the possibility. There have been many times when some royal or noble bride covered up beautifully until the time she was ready to reveal her sweet news. I can only base my observations on the past examples fortified with my several experiences: sudden loss of weight ( I went down to 84 lb with my first), the glow, or the loss of it; the fashion choices like belts, that are really not worn as tight as they used to be, skirts and tops to divide the perception. Here comes to mind the light blue sash on Christian Lacroix dress worn by the Duchesse de Vendôme. It was placed strategically in her waist to distract from the fact that she was three months pregnant. Being the thoughtful, loving people the Sussexes are, I would assume that they would wait with their announcement until Eugenie's joy is complete. Countess of Wessex was in navy blue. Meghan's coat may be to keep us from seeing what she is wearing. 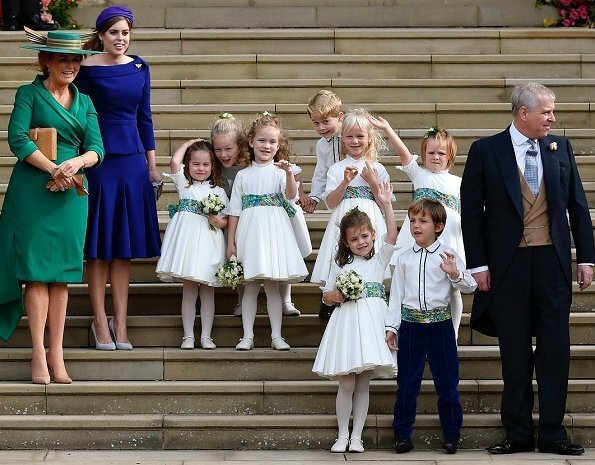 The focus is supposed to be on the bride, and Kate and Meghan's clothes do draw a lot of attention. She is not Meghan Markle anymore . She is to be addressed as the Duchess of Sussex, just as Kate Middleton is now the Duchess of Cambridge. WOW. Princess Eugenie was the star of her wedding-she was stunning,charming and gorgeous.I admire that she decided to show her scar.This gesture only embraces her beauty and stylish gown.I enjoyed to see emerlad during wedding-it 's original and unordinary than commonly diamonds. Princess Sofia of Sweden also wore a diamond tiara with emeralds on her wedding day. I must say I love a bit of color. Today was a day of growing up for Eugenie. Not only did she become a married woman, she chose to finally reveal her scar to the world. The design of her dress and not wearing a veil sent a strong message of support to the other (mostly girls) with scoliosis. The doctor that did her surgery was an invited guest. 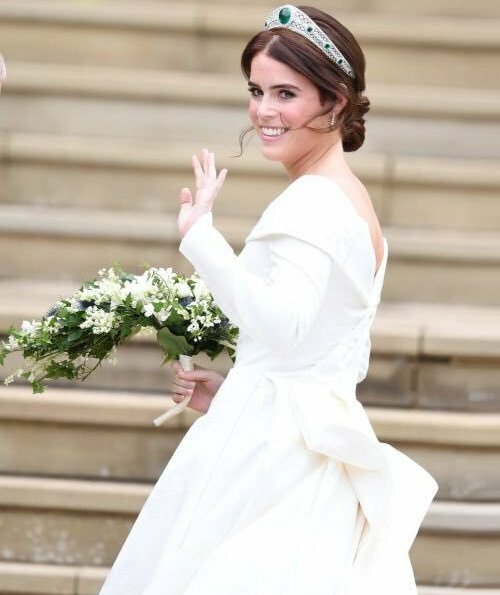 Not only is Princess Eugenie the first British Princess to be married( not re-married) since 1972 Princess Ann, but she is immediately one of the most beautiful royal brides. Stunning , surprising, and, as Sandra Svensson puts it: perfect. Good style here on the part of the two families, well done! 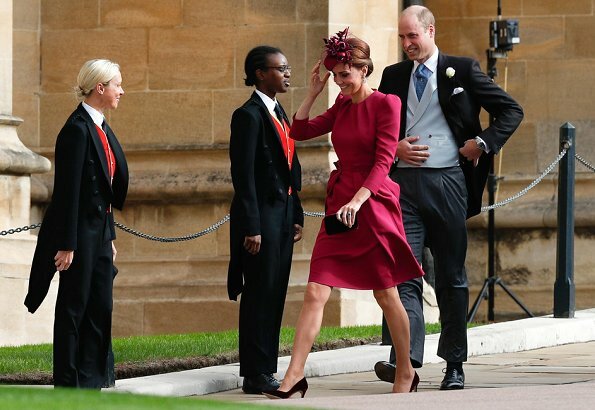 Catherine gets my Best Dressed vote; her dress was exquisite and fit her superbly (and I'm no fan of fascinators, but hers wasn't ridiculous-looking as they too often are). 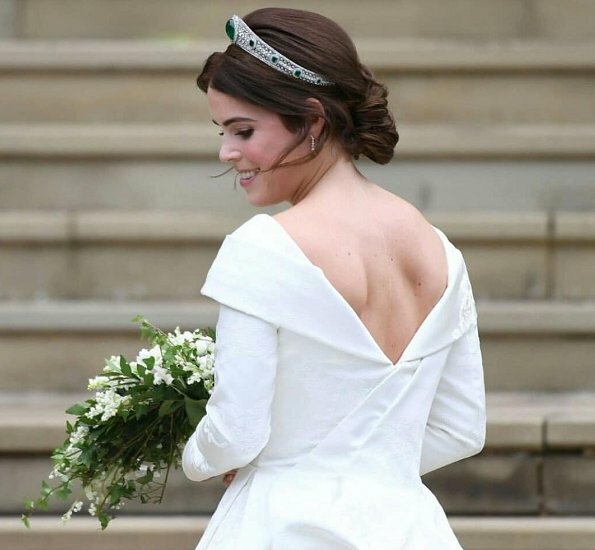 Would have loved to see a veil of some kind on the bride, and emerald green sashes on the little bridesmaids and pages, to go with the stone in Eugenie's tiara. Eugenia es una novia muy bella, su vestido es magnífico y original y la tiara Greville es un sueño. Que sea muy feliz. Me han gustado los trajes de HM, Sarah, Bea, Kate, Anne y Zara. Sophie y Meghan no me gustan, van demasiado oscuras. 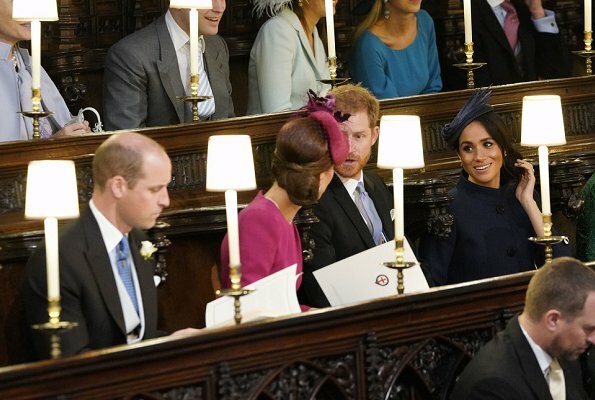 Countess Sophie wore black so I guess Duchess Meghan is in good company wearing blue. Its always autumn season for Meghan, same constant colors! She looks very good in blue. Agree, she looks good in blue and her fascinator is as well a good choice. Countess Wessex's dress is very deep blue and glitters beautifully. Just like her dress for the Sussex wedding the effect gets lost in photos. Eine ganz bezaubernde Braut - Eugenie's Brautkleid passt ausgezeichnet zu ihrem Typ - wunderschön! ! Eugenie is a beautiful bride. I am normally not a fan of kokoshnik tiaras, but in this case it is wonderful and suits her perfectly. The dress has just a tiny bit too much layers, but the overall look is wonderful. As Pine says, love Meghan's simple but well cut outfit and Catherine's shoes (most of all).No pictures of Beatrice who also looked stunning today! Eugenie was a beautiful bride. The emerald was exquisite with her hair color! Her dress was so classic and perfect. Catherine lovely in the rose color. Wish we could see pictures here of the mother and sister of the bride. Both of them were also splendidly dressed today. Beatrice looked so nice in the royal blue and Sarah gorgeous in green. So great to see Sarah, have really missed her and her genuine outgoing personality. What a wonderful service it was! Stunning bride and groom!!! Love the dress, makeup and hairstyle! 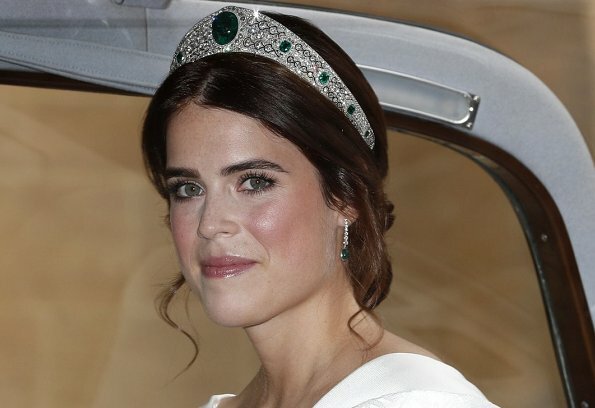 The tiara is a dream and Eugenie wore it so well. All the best to them! It was a beautiful wedding, her gown was amazing, the material was exquisite. I like the tiara without a veil and that seems to be the way some of the younger brides are doing nowadays. Going veil-less. Jack was so nervous I felt sorry for him, she is used to this type of attention but I can imagine how overwhelming it felt for him. Sarah’s dress was far too tight but very nice otherwise. She looked uncomfortable in the dress and the setting. I could see that she was also very nervous. The Duke of York didn’t really seem to be giving her as much attention as I expected. 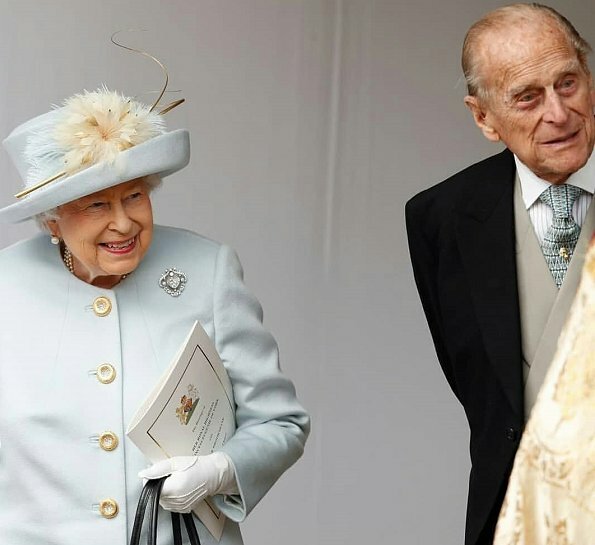 The Queen and Prince Phillip looked wonderful, I missed seeing them together since his retirement. Sarah's dress was noit only too tight. but there was that weird tail or something. And her hat is on par with the monstrosity Beatrice wore to the Cambridges' wedding. 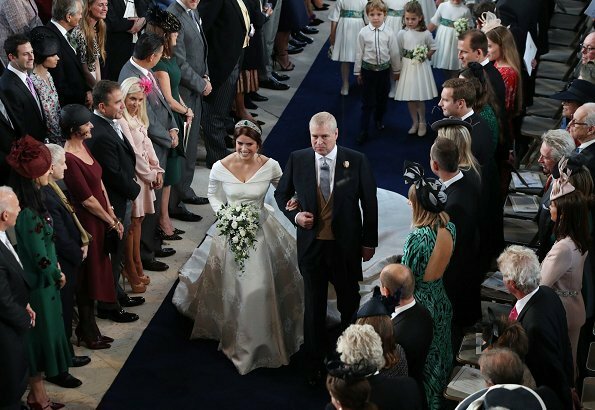 Princess Eugenie specifically chose not to wear veil and to have a low cut back on the dress. She was aiming to show off the scars from the scoliosis surgery she had when she was 12 years old. I think that was a very sweet touch. Agree. Sarah had many months to prepare and ended up in a too-tight dress that accentuated her in the wrong place and a hat that looks like the snitch from Harry Potter movies. It's hard to understand because her daughter Beatrice and nearly every other lady there looked wonderful. She's no fashionista, never has been. And her hat is ridiculous. On the other hand, Beatrice looks very good for a change, although she could have chosen another color. I feel sorry for Sarah because you could see that she felt alone and she panicked hidden under her hat and when getting out of the car in front of the stairs. Nevertheless and all in all Sarah made a good job on her daughters wedding day. Chapeau! Beautiful bride.Meghan and Catherine elegants. Princess Eugene is a beautiful lady, and today she was radiant full of joy, classic dress and a stunning tiara. From the other ladies, i like Beatrice, Kate, Sarah's dress was nice but too tight. Congratulations the newlyweds!! Eugenie: Of course every bride is beautiful, for me the dress is ok but for my taste to old fashioned. Beatrice: wow. she looks fab! No weird style as in so much other cases. Fergie: Very nice dress, but wth did she think with this hat?? Looks like having wings.. The Queen and Philip: wonderful! Queen as beautiful as always. Kate: fab, fab, fab, fab!! LOVE this style so much, wonderful dress, great fascinator, top! I'm a bit sad that journalists showed pics/vids from dressmalfunction because of this crazy wind. They shouldn't have showed, she's a Teen!! Poppy Delevingne: I don't know what she thought... looks way to naked and that h o r r i b l e fascinator!!!! gwah! Anna B., I think the same about Lady Louise. She's a very young girl and should be protected! Eugenie sieht bezaubernd aus. Ich mag den Ausschnitt des Kleides sehr und die Tiara ist toll!. Mutter und Schwester sehen ebenfalls elegant aus - und nicht over the top:-) Die Queen, ihr Mann und all die anderen haben sich sehr geschmackvoll gekleidet. Alles Glück und Gute für die Frischvermählten! I thought the Greek royals looked very fine; so did the Hanoverians. Someone should have given the TV guys more info. They'd missed so much, and so many. Warum war Camilla nicht dabei? Prince Charles wollte auch schnell wieder zu seiner Angetrauten zurueckfliegen. Gibt es Familien, in denen es nur Friede, Freude, Eierkuchen gibt? Maybe Camilla should remember her place. She entered the royal family as an interloper. A family wedding should have been more important. This definately makes her look bad. At least she wasn't missed too much. Totally disagree Chardonn8r - she had a longstanding previous engagement that would have involved letting down several people. She didn't enter the family as an interloper - both she and Charles were divorced and free to marry. I don't think it makes her look bad, I think it makes her look professional and dutiful. 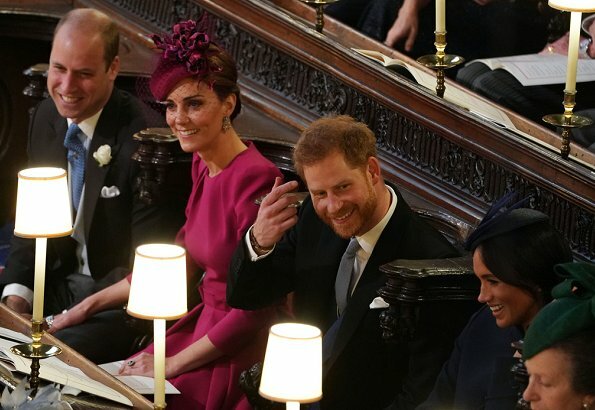 Some observers may not have missed her - although they seem to have plenty to say on her absence - but we have little way of knowing whether the wedding guests missed her. 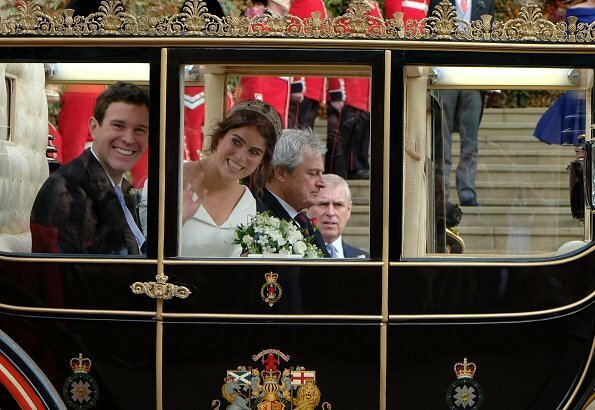 I don't suppose Eugenie and Jack did - they were enjoying their big day. And according to what I've read they completely understood. Franny, we can disagree about Camilla. When you are the mistress of the future king, while you are both married, you have entered as an interloper--in my opinion. It's not a secret that Charles and Andrew don't get along very well, and it makes her look bad for not being there--again, in my opinion. It depends on the sources you read if she could have cancelled or postponed the commitment to the school. I completely agree with you that Eugenie and Jack did not miss her. At the end of the day, that is the most important thing. They look so happy. Again Congratulations and all the very best to the young couple. 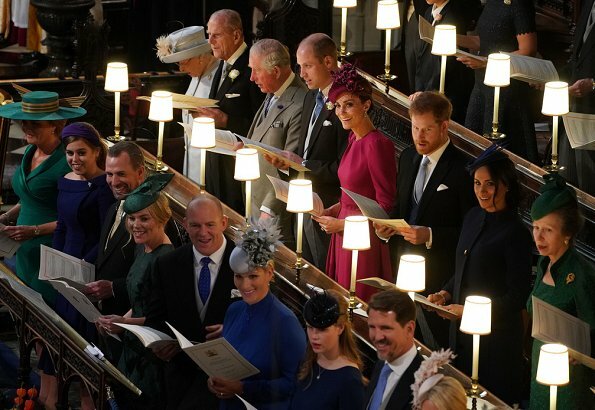 I am glad Prince Philip could attend his granddaughter's wedding, she must have been thrilled to see him there.﻿ Nevertheless I was so happy that Sarah Ferguson was there!!! Duchess of Cambridge and Meghan looked good as always and their hair looked great! Not to forget the little ones, too cute, lovley. 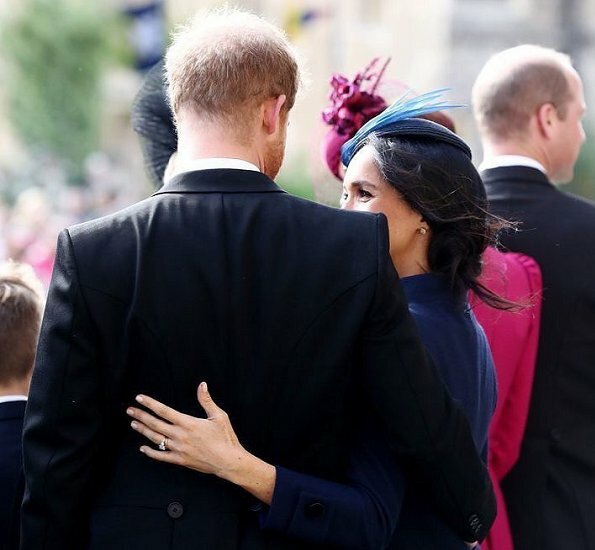 Duchess of Sussex is enchanting. Eugenie is beautiful bride. Very nice make up and hair. Green is good colour for Fergie,but I don't like the hat. Beatrice quite nice as well. Kate's hat and colour of the dress are good but the style of the dress looks bad. Sophie and Meghan has nice dresses. I'm glad you brought up Kate's dress. I agree with you. The color is beautiful on her, but so many of her dresses look alike. I was so disappointed when first saw it, then realized in this case it might be for the best as it doesn't draw attention from the bride. I think Kate is a pretty girl, but her style could be much better. She is too young to follow QE's fashion style. Maybe she can adopt that the day she will be a Queen herself. Spanish Letizia or Danish Mary could give her some tips for now. I like Kate's casual style though. I agree with these comments. Kate is young and lovely and she loves to play with colors, but i would love to see her in different styles/cuts though. Her dress is something you expect her to see in. I think this style is actually the same as the pink one she is wearing during 2017 trooping. She is known to own same pieces in different colors. 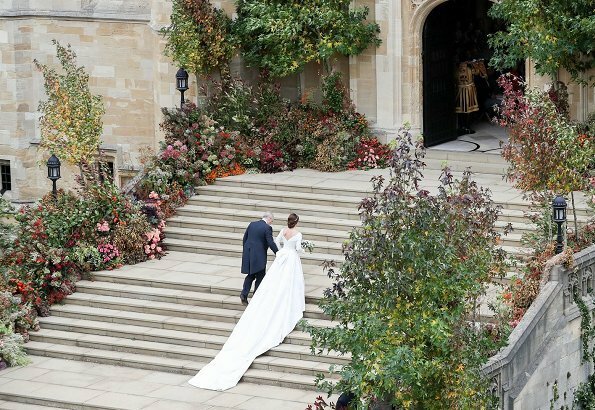 Eugenie looked fabulous- love her gown with the low shoulder low back design. No veil looked good allowing the wonderful tiara to just look magnificent. Make up and hair were great too. Sarah looks good in green, a bit tight but nice. Bea looked good as well although slightly unusual choice for maid of honour. Catherine looked wonderful in the berry coloured outfit (glad she didn't trot out one of her 50 shades of cream coatdresses). Meghan fine but a bit boring. Sophie Wessex I like it but maybe some colour would have lifted it a bit. Camilla had a previously scheduled appointment. Alexandra had an injury (broken arm I think). 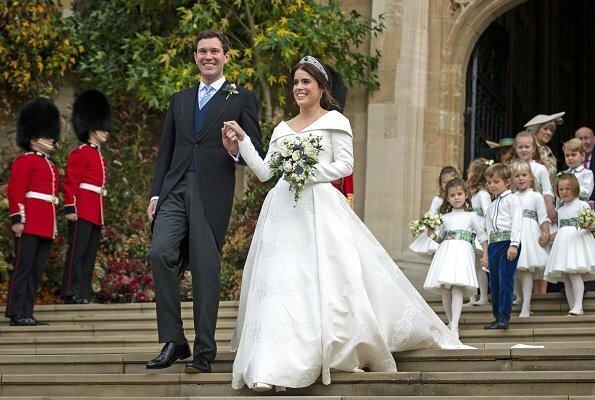 At today's Wedding,I must say Pss Eugenie was the perfect bride wearing a perfect dress. The Emerald Tiara is very very nice,matched nicely with the earrings from her now husband. I wish them eternal Love and Happiness. The Queen looked great so did Catherine Meghan Lady Frederick Windsor and so on. Sadly there was no guest list so one could read of who all was there one could only see a few. Cherry Blossom, it's not an embroidery; it's better! It was designed to accommodate the bride's ideas and wishes, then woven in Italy into this enchanting jacquard fabric. Lot's of Royals. So nice the see the DoE went to the Wedding of his Granddaughter. Alway's classy. Did anyone seen a Guestlist? Love Kate's hair. Jack Brooksbank seems to be enjoying his wedding. Unlike Prince Harry who barely cracked a smile at his. Prince Philip sitting behind Fergie. Bet he loved that. Love Eugenie's dress, especially the fabric. The style suits her. Love the colorful autumn flowers. They look very happy and relaxed. That is an odd comment about Harry. This comment is odd, is it irony. 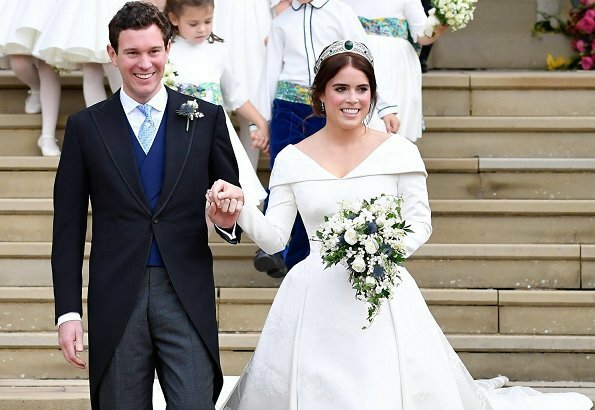 Jack Brooksbank was nervous, you could see, that he is not used to the media a.s..
Eugenie is such a beautiful and happy bride! Catherine looks wonderful, great colour! But the real stars for me are Charlotte, George and the other cute little children! Wow. I'm impressed by the duke of York. He always helped Eugenie with her long train. Even after the wedding ceremony, before the carrige ride. Such a caring father. It was nice to see more of the lovely York Family today. Happy people always looks nice, but about those recommended style lessons: NO. I don't understand the suggestion for "style lessons"??? I think they all deserve the right to have their personality respected. I caught the comment earlier as well. "A true princess"...maybe it refers to being a blood princess? Maybe Anon just doesn't like Kate and Meghan? What a simply stunning bride. Beautiful dress which suited her perfectly. And they were both so happy. Loved the whole thing. Duchess of Cambridge, Princess Beatrice and Lady Ella Windsor were the outstanding winners in the fashion stakes today. Agree with the comment about the lack of knowledge of any but the major players at most royal events. And the camera operators who move to pictures of cars or horses when the 'minor' royals are arriving or leaving these events. Best dressed was the mother of the groome!! Loved her floral ensemble and hat. Very elegant!! In my opinion she was the best dressed!! Eugenie looks stunningly beautiful. Love her dress, its such a great and flattering style. That tiara looks fantasic, also good hairstyle, makeup, flowers and happinnes radiating from her face. No veil but it was made up with that long train of her dress. This dress was unique, classic, yet modern looking princess dress. Wishing them lots of love and happiness in their marriage. May they have long and happy life together. I agree! Her outfit and hat were gorgeous. prinses Eugenie was zo mooi met haar prachtig kleed, mooie hals, mooie rok en mooie stof. Prachtige jurk, die van Megan was niets, zo simpel, TE simpel. En dan die Tiara, prachtig in de zon. Ik wil Megans kleed niet afbreken, maar ik vond er niets aan. ik heb de moeder van de groome niet gezien, en ook geen foto. Hebben jullie een foto van haar?T Is toch de moeder. 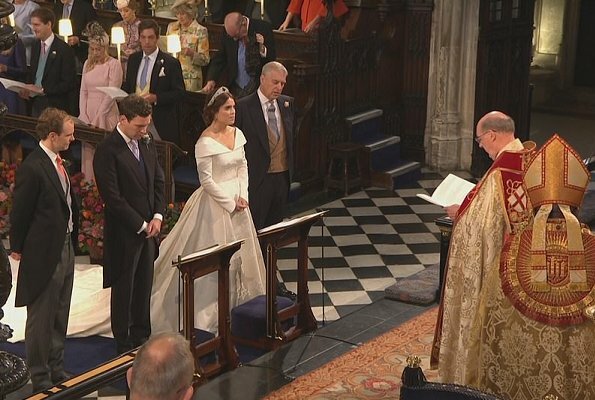 Not certain if we already covered this: the personal detail on the little bride's maids and pages which Princess Eugenie chose to showcase; It is also her way of showing her independent career besides being a royal: The special pattern of the bands is a detail from a piece of art that featured in the couple's Order of Service - a painting called Here, by American artist Mark Bradford. A reminder of Eugenie's career in the arts and current role as director at the contemporary-art gallery Hauser & Wirth. How appropriate! Thank you for that interesting information, Liza! I did not know that. Sad that the tiara slipped out of its place, and left a large 'dented' area in the top of her head where the tiara had moved from. What a beautiful Princess! I like that Sarah doesn't hide her figure!!! Her bridal look was very successful, she was looking better than ever. I think Eugenie and Jack look also both to be nice persons. Reminds me somehow about Victoria and Daniel. A beautiful bride! I read the provenance of the tiara, that said, I agree it is a statement piece that says granddaughter of the Queen. Further, it says descendant of Queen Victoria. Its wonderful how she choose to make a statement about scoliosis with the dress design. The photographers got some good photos of Andrew, awesome father of the bride. I'm showing my age: back in the day, Sarah wrote a book about Budgie the helicopter and the proceeds went to charity. Further, Andrew was a helicopter pilot, including during the Falkland Islands/Las Malvinas conflict. Maybe it was subconscious that the ends of the ribbons on Sarah's hat looked like wings, but it was a nice detail.